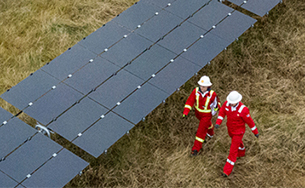 Our people are essential to Shell’s success. We work to maintain a productive and healthy organisation by employing and developing talented people, continually strengthening our leadership, and enhancing employee performance by fostering strong engagement. 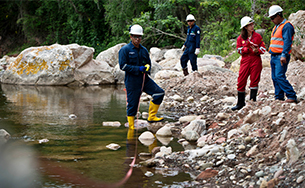 we provided almost 315,000 formal training days for employees and joint-venture partners. During 2018, we employed an average of 82,000 people in more than 70 countries, with around 43% of our people operating in countries outside Europe and North America. Dialogue between management and our people takes place directly and through employee representative bodies where appropriate. We offer multiple channels for employees to report, confidentially and anonymously, breaches of the Shell General Business Principles or our Code of Conduct, or other concerns. 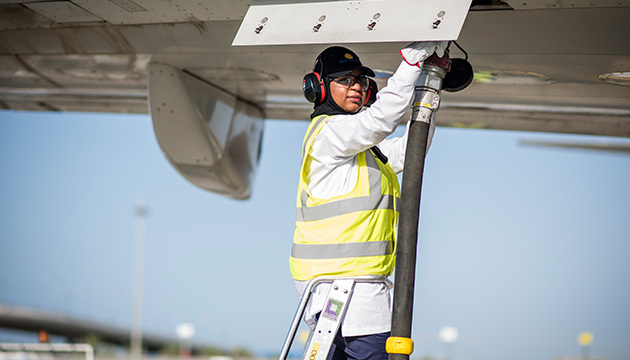 In Oman a team of female operatives refuel planes for Shell Aviation. We provide equal opportunity in recruitment, career development, promotion, training and reward for all employees, regardless of gender, ethnicity, sexual orientation or physical ability. We actively monitor diversity on a global level and measure the representation of women and local nationals in senior leadership positions and have processes in place to identity and mitigate biases. 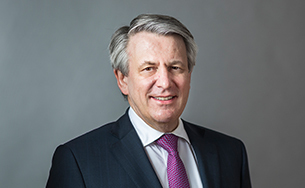 Shell aims to manage the impacts of business changes on people respectfully, honestly and with integrity. Affected employees are supported in their search for alternative employment as appropriate by country law and policy. The Shell People Survey is one of the principal tools used to measure employee engagement, motivation, affiliation and commitment to Shell. It provides insights into employees’ views and has had a consistently high response rate. In 2018, the response rate was 82%, which was an increase of 2% compared with 2017, and the average employee engagement score was 77 points out of 100, which was an increase of one point compared with 2017. In 2018, we launched an initiative called "I’m Not OK" to promote open and honest conversations about mental health. The initiative is designed to help employees support each other, create awareness about how to access the professional counselling available through Shell’s employee benefits, and to empower teams to create a workplace where it is safe to say ‘I’m Not OK’. Our diversity and inclusion approach focuses on hiring, developing and retaining the best people. Embedding the principles of diversity and inclusion in the way we do business gives us a better understanding of the needs of our people, partners, suppliers and customers. A diverse workforce, and an inclusive and caring environment that respects and nurtures diverse people, is a way to improve our safety and business performance. At the end of 2018, the percentage of women in senior leadership positions was 24%, compared with 22% at the end of 2017. We continue to measure and work to improve our gender balance by making female leaders more visible and accessible as role models, by providing leadership programmes for women and by embedding diversity and inclusiveness in our policies and processes. In 2018, Shell became the first major integrated oil and gas company to set a global minimum standard of 16 weeks’ paid maternity leave. In 2018, our CEO joined the Catalyst CEO Champions for Change, a group of more than 50 CEOs who pledge to support women’s advancement at all levels of leadership. We also launched a global campaign on closing the gender gap in engineering and technology – joining forces with the UK’s Royal Academy of Engineering to inspire the next generation of engineers, challenge associated stereotypes and showcase how rewarding and fulfilling such careers can be. In 2018, we introduced our workplace accessibility service, which currently serves 62 locations globally. The service is designed to ensure that all employees have access to reasonable physical workplace or other adjustments so that they can work effectively and productively. 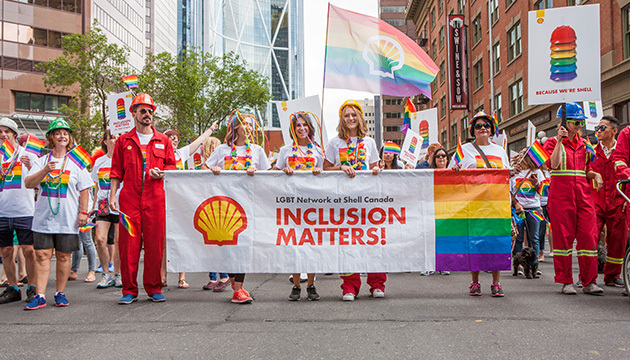 Shell employees in Canada proudly wear the rainbow colours, the universal symbol for equality. At Shell, we support and enable remarkable people from every background, and strive to be a pioneer of lesbian, gay, bisexual, transgender and intersexed (LGBTI) inclusion in the workplace. In 2018, we were recognised as one of the top three organisations in the Workplace Pride global LGBTI inclusive workplace benchmark and earned a 100% score in the Human Rights Campaign Foundation’s Corporate Equality Index. We have also pledged support for the UN LGBTI Standards of Conduct for Business.